There’s a new kind of volcano in town, according to a new study. In 1997, a team of Japanese scientists conducting research cruises and dives in the northwestern Pacific Ocean discovered a field of volcanoes in the Japan Trench, with some volcanoes as young as 1 million years old within a 130-million- to 140-million-year-old tectonic plate. Now, the scientists say that those seamounts represent a previously unidentified type of volcanism — one in which the bending of a tectonic plate is bending the rules. 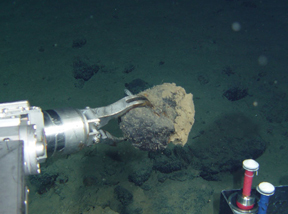 The submersible Shinkai 6500 collects samples of young lava found near the Japan Trench. Researchers believe the “petit spot” volcanoes in the trench formed as the tectonic plate flexed and cracked, allowing magma from the upper mantle to rise and erupt. Photograph is by Naoto Hirano. Scientists have long thought that volcanoes can form in three basic tectonic environments: where the plates that make up Earth’s hard outer crust split apart; where they collide; and, sometimes, at so-called hotspots located puzzlingly far from a plate’s edges. Scientists have hypothesized that these hotspots — such as the plume that is widely thought to have formed the volcanic chain of Hawaii — are fueled by jets of magma rising from deep inside Earth, at the boundary between the core and the mantle. That hypothesis is supported by the observation that hotspot magma is chemically distinct from volcanism with a shallower mantle source, such as the magma erupting at mid-ocean ridges. But the young volcanoes found in the Japan Trench comprise lava that resembles ocean-ridge magma in its chemical composition, and were found in the northwestern Pacific Plate, which is an old, cold oceanic plate with no known hotspots. The lavas’ isotopic composition — high in the radiogenic isotope argon-40 relative to argon-36, which is higher in hotspot lavas — suggests that they originated from the upper mantle, says Naoto Hirano, a marine geologist at Scripps Institution of Oceanography in San Diego, Calif., who dated the original lavas from the trench. The question remains, however, how such intraplate volcanoes, dubbed “petit spots” for their small sizes, could have formed, if not from hotspots. Publishing in the Sept. 8 Science, Hirano and his team suggest that one possible avenue for upper mantle volcanism within an older plate is plate flexure — when a plate bends under the weight of a geological load, such as ocean islands or even a heavy string of volcanoes formed by a nearby hotspot. Under the added stress of these heavy loads, older plates — which become more brittle as they cool and move away from a mid-ocean ridge — can develop cracks, Hirano says. Those fissures in the plate could provide a path for magma from a partially melted upper mantle to rise to the surface, he says. That mechanism has been “kicked around” before, says Marcia McNutt, a geophysicist at Monterey Bay Aquarium Research Institute (MBARI) in Moss Landing, Calif. For example, in the vicinity of Hawaii, where the heavy islands formed by the hotspot have weighed down the plate, such cracking has distributed magma around seamounts, she says. In addition to suggesting a new kind of volcanism, Hirano says, one of the important implications of this find is that it provides additional information on the physical state and composition of the upper mantle. For this shallow volcanism to occur, the upper mantle would need to be partially melted — an idea that is still being hotly debated, McNutt says. “There are a lot of people who believe it is partially melted,” she says, but the issue revolves around whether the melt is continuous throughout the upper mantle, which would be necessary to provide enough melt to form these volcanoes.